Honestly I don't know how she does it. She is on yet another new antibiotic to help her fight off her roaring sinus infection that we found out about on Monday. We took her down to get another sinus CT (CAT scan) because she has been so miserable lately. Coughing at night and carrying a bowl around sometimes during the day. Other times she seem full of energy and is just playing outside seeming rather normal. She's a little trooper. Now, after looking at the top of our microwave and seeing this whole new batch of drugs I think I see why Abby's not feeling so good. 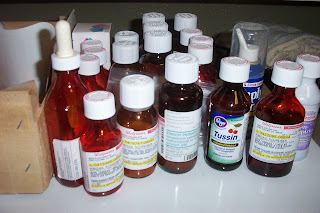 I mean who would feel good with all of these medicines?! And man, what would she feel like without them? Tonight I gave her an anti-nausea, a cough med with codine, some antibiotics, zantac, Tyleno, and I still have to give her the two chemo drugs later tonight. Crazy. She's had a pretty high fever off and on for the last week. 10 days ago it was 103, and then last weekend it climbed to 102 and then hung out for a few days at 101. Today it went away for the afternoon but was back at 101.5 this evening. Pray that it goes away tomorrow becuase if it doesn't then we'll probably have to take here in again or admit to the hospital. 3 weeks of the antibiotic and then we'll do another CT. If it is still there then we'll talk to the Ear, Nose, Thoat Doc to see what to do next, maybe another 3 weeks of antibiotics, maybe surgery. So, please pray that this sinus infection will go away soon! Tuesday she will also be going in to CHOA for a spinal tap, chemo, IvIG, and an eye appointment with Dr. King. This Friday, we have an appointment with the GI Doc. to see what's up with her tummy and what the appendix thing is all about. So, that's our boring life. Sorry there's not too much to talk about :) Pretty typical her at the Schreibers' house! No really, I'm doing ok with it even though I'm a bit tired and also sad about all that she's had to go through. Tiffany has her good days and bad days too. Anna and Lily are pretty oblivious so they've been fine. Please pray for our family, for Abby, and for all the germs to take refuge into somebody elses house for a little bit. You are traveling an incredible road. We are praying for you all and for your sweet little Abby.